This approach is somewhat difficult to quantify due to the highly variable results it is likely to have across review divisions and trials. For example, as one recent paper points out, there are considerable differences among review divisions in the length the NDA review and approval process, and to some extent, these differences are driven by differences in workload and staff resources across the various divisions (Milne & Kaitin, 2012). The same paper shows the impact of holding an advisory committee (AC) meeting on new molecular entity (NME) approval times to be ambiguous; in some review divisions, meetings are associated with shorter average review times, whereas in other divisions, they are actually associated with prolonged review times relative to cases where no meeting was held. Given the differences in resources and requirements across review divisions, we attempted to gauge what types of improvements in efficiency were viewed as being achievable by FDA itself. According to the PDUFA performance goals for fiscal year (FY) 2013-2017, one of FDA’s objectives is to “[r]eview and act on 90 percent of standard NME NDA and original Biologic License Application (BLA) submissions within 10 months of the 60 day filing date”(U.S. Food and Drug Administration, 2012c). We therefore assumed that improvements in efficiency could result in a reduction of the length of the review phase to 10 months across the board. It is also possible that greater efficiency and improved communication with industry could result in increases in success probabilities in the review phase; however, we did not have enough information to model this potential impact. If this approach and the previous one (priority review/priority review vouchers) are selected, the model will use the shorter of the two time periods for the review phase lengths (six months). 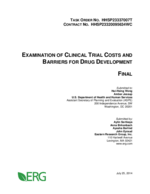 Similar to the previous barrier mitigation strategy, this strategy reduces the time to market thereby increasing the eNPV of the sponsor but does not reduce the cash outlays for doing clinical research according to our model.